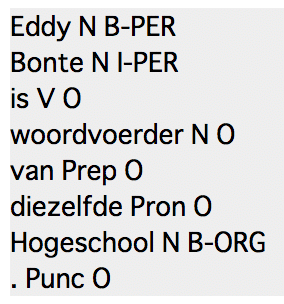 Eddy Bonte is woordvoerder van diezelfde Hogeschool. We provide a brief description of LSTMs and CRFs, and present a hybrid tagging architecture. This architecture is similar to the ones presented by Collobert et al. (2011) and Huang et al. (2015). This data is in the CoNLL2003 format. Each line has four columns containing the original word, it’s part of speech (POS) tag, a partial parse (chunk) tag, and a NE tag. For example, the first full line says that the original word was “EU”, the POS tag (as predicted by a tagger) is NNP, the word is inside a noun pharse (I-NP) as predicted by a partial parser and the word should be tagged as an organization name (I-ORG). For more details on the CoNLL2003 data format see the official CoNLL2003 shared task website. Input files for the training script have to follow the same format than the CoNLL2003 sharing task: each word has to be on a separate line, and there must be an empty line after each sentence. A line must contain at least 2 columns, the first one being the word itself, the last one being the named entity. It does not matter if there are extra columns that contain tags or chunks in between. Tags have to be given in the IOB format (it can be IOB1 or IOB2). 14041 / 3250 / 3453 sentences in train / dev / test. processed 51362 tokens with 5942 phrases; found: 0 phrases; correct: 0.
processed 46435 tokens with 5648 phrases; found: 0 phrases; correct: 0. New best score on dev. New best score on test. 24952 / 25121 / 21424 sentences in train / dev / test. processed 572827 tokens with 26397 phrases; found: 0 phrases; correct: 0.